It has become a regular occurrence for online gaming site, Springbok Casino to introduce new games to its players. Almost every month, the South African facing site rolls out exciting new games, and February has been no exception. The site recently introduced a branded sequel to its ever-growing arsenal of online casino games and players can now enjoy the highly entertaining The Three Stooges Brideless Groom game. This slot is a sequel to the Three Stooges III slot that was introduced by Realtime Gaming last year. The Three Stooges slot series became an instant hit among local players as soon as the first one was launched. According to Springbok Casino manager, Daniel van Wyk: "I've never seen an online casino game become so popular as quickly as the first Three Stooges game did. I guess Larry, Curly, and Moe have a lot of fans in South Africa!" 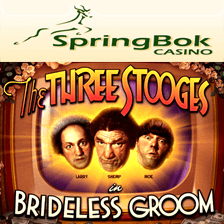 While players have been enjoying The Three Stooges Brideless Groom slot at Springbok Casino for a few weeks now, it is worth mentioning that a related bonus is soon coming to an end. Players can claim 100% up to R2,500 by playing this game at the online casino until February 28th. To claim this bonus, players simply need to enter the coupon code BRIDELESS. Of course, the slot game will be available at Springbok Casino beyond February. The game is a unique 33 pay line game with many special bonus features that make it entertaining as well as rewarding. 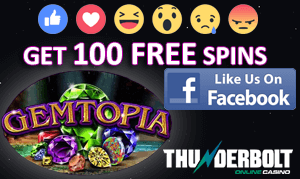 The game offers free spins, multipliers and a cool Whacky Wild feature. The Three Stooges wild symbol in the game (animated and highly amusing on its own), actives the re-spins feature if it suddenly appears on the middle reel of the game. However, when the wild appears on reels two, three or four, it triggers the Stooge Picks feature. In this bonus game, players need to pick out two pieces of a broken hard and the rewards will be a-plenty! These range from free spins in the game to Whacky Wilds or extra multipliers. If all that wasn't enough, players could find themselves enjoying 33 free spins that have the potential to be randomly triggered through the Lucky Stooge feature at the end of each spin.